Comarco Groups newest subsidiary, Comarco Myanmar Company Ltd. has delivered the necessary gas conversion equipment to generate electricity for the southern region of Myanmar known as Tanintharyi. The transformers and additional loads were loaded onto Comarco 2101, a ballast-able barge with a 15T/m2 capacity in Ranong, Thailand and delivered into the remote river ports of Kanbauk and Dawai. Once operational, the project will generate 80 megawatts of power for the local community by converting gas from the Zawtika pipeline that runs from offshore Myanmar into Thailand. Although navigating the Heinze river, avoiding fishing nets and manoeuvring a 210ft barge in extremely tight quarters in a narrow section of the river was no easy task, it again shows the value in the river barging service as we were able to deliver the cargo a short distance from the project locations. This is particularly true for projects in this regin that would otherwise have to rely on an underdeveloped, hazardous road network and where the transport of heavy loads is frequently hampered by the existing low-capacity bridges. 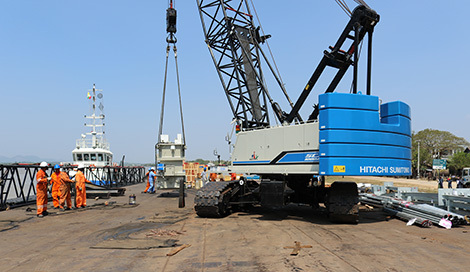 C2101 has onboard a new 100T Sumitomo crawler crane that was towed by Comarco's newest tug Shwe Lin Yone (Golden Eagle), the Singapore flagged 1300hp tug.